Nearly a year ago, Hurricane Sandy made landfall on the eastern seaboard of the US, wreaking havoc on the lives of millions of people in its path. 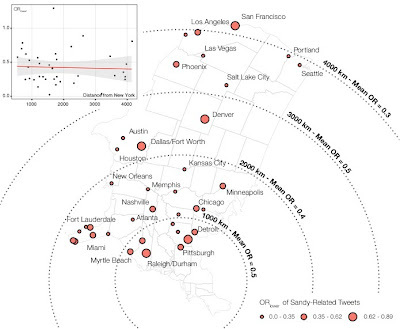 At the time, we threw together some quick maps of where Sandy was being talked about on Twitter, and how the geographies of Sandy-related tweets were both intensely connected to the material impacts of the storm, but also somewhat incongruent. 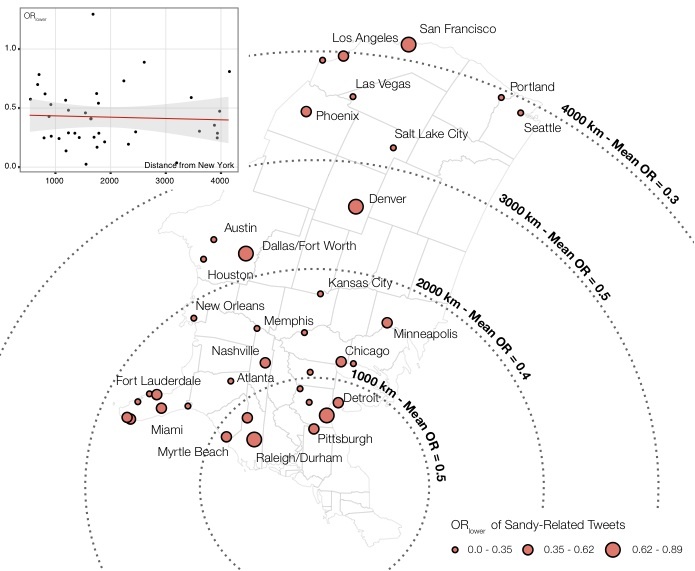 Since then, we've been putting the finishing touches on a paper that extends our initial interest in the data shadows of Hurricane Sandy to a more comprehensive look at how we can use Sandy-related tweeting to understand the multidimensionality of the geographies of social media activity. All too often, a one-to-one connection is made between the location of a geotagged tweet or other piece of social media content and the content of that tweet . We have instead been attempting to understand how we can think through, and then visualize, how geotagged tweets reflect and produce much more complex socio-spatial relations, which include both intense connections to the places where such content is produced, as well as much more physically distant locations which are brought closer in relational space through such informational flows. The rest of this post is adapted from our paper-in-progress, and outlines how we can map and measure the relational spaces of Hurricane Sandy. Using T-100 Domestic Market data from the Research and Innovative Technology Administration (RITA) on flights and the number of passengers between city pairs in 2012, we determined the 50 cities that have the most passenger traffic with New York City, ranging from Chicago (3.5 million passengers back and forth) to Kansas City (175,000 passengers). Since operations and activities at some airports close to New York were directly affected by Sandy’s landfall, we exclude any airport within 500 kilometres of Manhattan in this analysis. For the remaining airports we used a buffer of 5km to collect all Hurricane Sandy related tweets and calculated the lower bound of the odds-ratio (or location quotient). 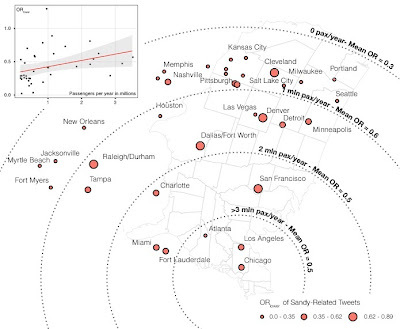 This metric measures the level of Hurricane Sandy tweets relative to overall Twitter activity . If relational networks did not play a significant role in Sandy-related tweeting, one would expect to see a direct distance decay effect: as the distance from New York City increases the odds-ratio should decrease. 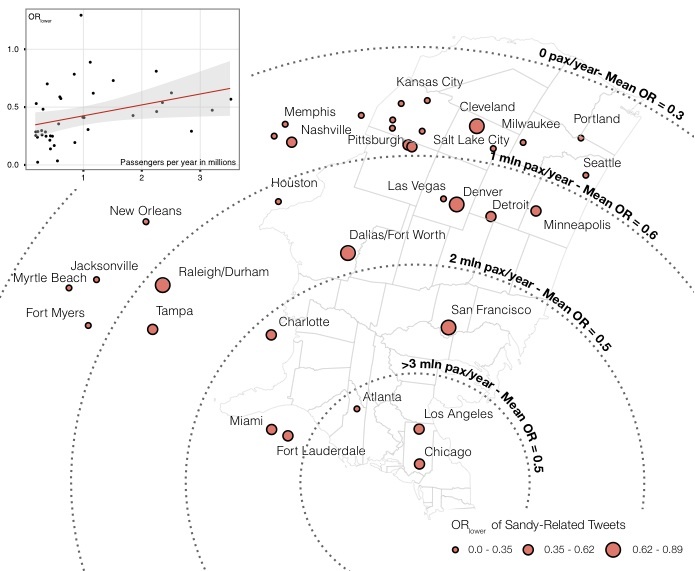 Our map shows, however, that physical distance has no significant relationship with the relative level of tweeting activity about Hurricane Sandy as is evidenced by both the scatterplot and the map (Spearman’s rho is -0.05). The map uses an azimuthal equidistant projection with New York City as the center, where the size of each airport is proportional to its odds ratio. Airports that are equally distant in physical terms from New York have widely diverging measures of Sandy-related Twitter activity. In addition, the average odds ratio in each 1000km zone does not decrease the further away one travels from New York. In contrast, a slightly altered version of our map shows that the number of passengers between each city and New York City exhibits a much stronger positive correlation with the odds-ratio metric of Twitter activity (Spearman’s rho is 0.34). This figure preserves the directional bearing of each city with respect to New York City, but instead uses an inverse of the number of passengers to recalculate the relational distance between the cities. Airports are thus no longer displayed according to their physical distance from New York City, but rather based on the intensity of air traffic between the two cities. Since the bearing has remained the same, airports with a higher intensity will move closer to New York along that line, and vice versa. In addition to the correlation coefficient, we can also visually determine that cities with a lower odds-ratio, such as Pittsburgh and Memphis, have a tendency to move towards the outer circles while cities with a higher odds-ratio, such as San Francisco and Los Angeles, move relatively closer. In other words, it is the relational connection to New York, measured by number of air travelers, not physical distance, which better explains the level of concern with Hurricane Sandy as expressed via Twitter. This concern, however, can vary within metropolitan territories depending upon the scale of analysis; some parts of an urban area may have much stronger relational ties to distant cities, while other parts are largely disconnected from such global flows. To test the extent to which the data shadows of Sandy-related tweeting are a localized phenomenon within certain parts of metropolitan areas (rather than a more generalized territorial phenomenon), we increased the initial buffer around each airport from 5km to 25km. Thus, rather than just capturing neighborhoods that are spatially proximate to the airport, this measure captures a much wider swath of each metropolitan area. With this larger buffer, there is a near-reversal of the correlations illustrated in our first map, as Pearson’s rho for total number of passengers is now 0.06 (rather than 0.34), while the distance effect starts to emerge (rho is -0.15). In other words, even though the sociospatiality of a phenomenon like Sandy is expressed partly through a network of connections between territories, these connections are very much bounded by the locally-specific practices of place. This once again highlights the complex ways in which the digital data shadows of a material event are manifest through the intertwinement of different dimensions of social space. As evidenced by these examples, Sandy’s data shadows are not evenly distributed through the continental United States. They are instead quite intense in some locations, while hardly reaching others at all, demonstrating the multiple spatial dimensions of social processes such as the response to Hurricane Sandy. We're as guilty of this as anyone. I have tried to comment many times, but it never seems to work. Just so you know, I did come for the sheep and stay for the maps. As a Fiber Artist, I love your logo, and I read almost every map. Your explanations are a challenge for my non-mathematical background, but I always get the gist of them. It's a good thing too, or the second map today would have made me think you guys were taking way too strong of drugs over there. Keep up the great work.